← Chapter IV. The Mind: – Its Two Faculties, Will and Understanding. Nature is a wonderful thing. Individuals and governments are committed to showing more respect for the environment rather than carelessly destroying it. Concern about the sustainability of the planet and its protection is a contemporary attitude that is becoming quite common. I feel it reflects a spiritual sensitivity to the goodness of the unspoilt natural world. Nature is familiar and easily described, yet somehow it can evoke something less obvious and difficult to express in words; something mysterious and on a different level. Who hasn’t at one time or another not felt inspired by the beauty of a mountain vista, a seascape or a rainbow full of startling colour? Who has not felt at peace contemplating cattle quietly grazing, being cheered by the sound of birdsong heard in the morning, or being enraptured by the scent of the pinewood in summer? Has nature anything more specific to teach you? In general animals are well known for the way they protect and nurture their offspring, their practical good sense in the way they adapt to their habitat, and their ability to live in the moment. All spiritual qualities. But can we learn any specific lessons from different species? Has the fox or the snake something particular to teach us? Or is this just being anthropomorphic and attributing to animals human characteristics like in Aesop’s fables? I would suggest to learn from nature requires an objective attitude of mind — a willingness to look deeply into what is really there as opposed to taking on board the stereotypes learned from childhood. These birds soar high in the sky on widespread powerful wings and see with sharp sightedness what is far below. I can see a picture of the human mind here. 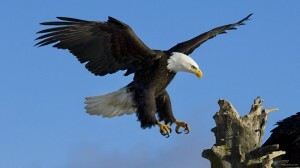 Isn’t an eagle’s perception one of a higher quality than the ordinary way of seeing things? Like uplifted thinking that searches out what is difficult to see when you are immersed in the mundane world of daily concerns. According to this viewpoint your mind is capable of soaring high to see life from a higher perspective. Here we find gentle playful trusting creatures, who reveal a joy of contentment and peacefulness. Such innocence is unselfconscious and unsullied by any thought of anything harmful or bad. Is this not a picture of the innocence of the Divine source of all that is good deeply present within your soul? The more you know about animals, the more you also notice their negative sides. Eagles are far seeing so that they can feed — predators which swoop down and carry off lambs. According to one theory this mixture of negative and positive is an additional pointer to the spiritual. It’s author, Emanuel Swedenborg, in his notion of ‘correspondences’, maintains that the natural world is both positive and negative because it is a reflection of human inner character, human beings having both good and bad elements to their conduct. For him, the positive is the higher reality of the divine perspective: on the other hand the negative is the lower perspective of egoism inverting and corrupting what is from the divine. Thus where some animals show a negative characteristic, this also alerts us to the spiritual factor again — but this time in terms of its opposite. Pigs are highly social animals. Properly kept they are a clean and attractive and can be quite intelligent. A pig will forage all the time, endlessly searching for something more to consume. For me this conjures up a picture of consumerism. People who allow themselves to become fixated on getting more and more things — money, clothes, gizmos, food, the latest fashion accessory etc. Pigs also have a reputation for gluttony and dirtiness. It is these latter qualities which provide the symbol of inner greed – the love of self that takes what it can get for itself searching out everything it can want. Donkeys have a notorious reputation for stubbornness, but this has been attributed to a much stronger sense of “self preservation” than exhibited by horses. It is considerably more difficult to force or frighten a donkey into doing something it perceives to be dangerous for whatever reason. However, once a person has earned their confidence they can be willing and companionable partners and very dependable in work. Cannot the donkey be seen as corresponding to a human natural way of thinking which can be argumentative and which would rather trust its own senses? I would suggest the donkey teaches us that such an attitude is capable of becoming trusting and obedient to a higher truth. Such an obedient understanding to deeper principles in people could carry us to a better way of living.